The pub on Market Hill, Barnsley now known as the Old No 7 and which is the brewery tap for Acorn Brewery, was for many years known as Carter’s No 7 after the family which ran it from 1878 to 1936 as a wine and spirit merchants. Patriarch Henry Carter was born in Northallerton in 1815 and came to Barnsley at some point before his marriage to Mary Robinson in 1849. His five children, William Henry, Joseph, Mary Jane, Margaret Ann and Matthew were born in Barnsley between 1852 and 1863. In 1871 Henry is running the Duke of York Inn on Cheapside as a Licensed Victualler, and by the 1881 census he is at No 7 Market Hill as a Wine Merchant with all three of his sons listed as his Assistants. He had lost his wife in 1877 but he lived until 1883, dying at No 7 Market Hill aged 69. They are buried together in Barnsley Cemetery with their married daughter Mary Jane Mantell who died in Sheffield in 1912. According to her entry in the 1911 census she had two children, but both had died young. Henry Carter senior left £3,500 in his will, worth around £170,000 in today’s money. 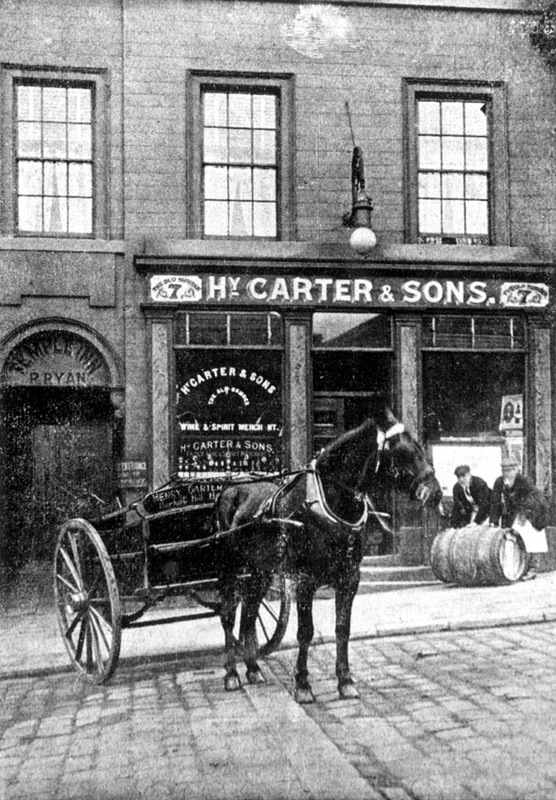 Eldest son William Henry Carter was living at No 7 Market Hill in 1901 carrying on the business of Wine & Spirit Merchant. A single man, he had his sister as housekeeper to look after himself and her children who were staying with him. Dorothy Hough, his niece, is listed as his housekeeper in 1911, keeping it in the family might have saved a bit of money! Dorothy marries Arthur Watkinson in 1916 and has one son; however both father and son die in 1918, this would be in the period of the great influenza epidemic at the end of the First World War. I cannot find her death, so maybe she remarried. His nephew Harry Hough does not go into the family business, he is a Railway Clerk and married with two daughters in the 1911 census. Henry’s second son Joseph, a Wine & Spirit Merchant of 7 Market Hill, Barnsley had died in January 1901, before the census, aged 47 and unmarried as far as I can tell. The third of Henry’s sons, Matthew, was carrying on the family name however. He had married in 1895 to Maude Schofield and had four children, Henry, Joseph Robinson, Matthew Schofield and Mary by 1901 when he was living at 109 Dodworth Road, but still apparently employed in the family business. There were two more children by 1911, both daughters, Maude and Marjorie. Matthew’s eldest son Henry was not listed on the 1911 census, aged 15 he was probably away at school, as we know he attended St Cuthbert’s College, Worksop. Showing his loyalty to his old school, Henry joined the St Cuthbert’s Squad of the Lincolnshire Regiment on 21 September 1914 shortly after the First World War broke out. He had intended to be an electrical engineer and at the time of his enlistment had been an apprentice at Messrs Thos. Taylor & Sons, Barnsley. He had been a good cricketer and had played for Barnsley’s second team. Henry had also regularly sung in St George’s Church Choir. It was reported that Private Griffiths heard him call after a “whizz-bang” burst, and rushed to catch him as he fell. He was unconscious from the time he was hit and died half an hour afterwards. He is buried in Becourt Military Cemetery in the Somme, France. The article notes that “the deceased would have been 21 years of age next August”. Second son Joseph Robinson (named for his grandmother we can assume) had also joined the army and at the time of his brother’s death was in training at Cannock Chase with the York & Lancaster Regiment. 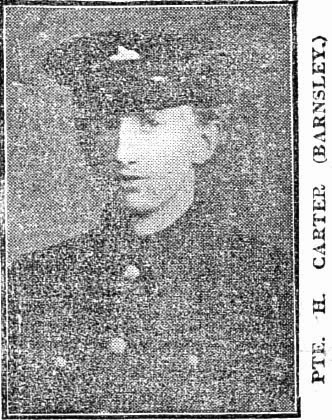 He was transferred to the West Yorkshire Regiment and must have been sent out to France shortly afterwards as he was reported missing in a Barnsley Chronicle piece on 4 November 1916. Born in 1897 he can only just have been old enough to serve abroad as the age limit in 1916 was 19 years old. His body must have been found later as he is buried in the Connaught Cemetery, Thiepval, in France and his date of death is given as 28 September 1916. Matthew Carter had now lost his two older sons, he also loses his youngest daughter Marjorie in 1923, aged just 25. We know that the Carter family name remained above the No. 7 until 1936 and this fits exactly with the death of Matthew’s his third and last son, Matthew Schofield (named for his mother) Carter in 1936 just 5 years after his father. Neither Matthew senior nor his son leave a great deal in their wills, so the business still seems to be in the hands of William Henry Carter who must surely have retired as he was 85 years old and living at 49 Sackville Street when he died in 1937. He left £23,620 in his will, or around £870,000 in today’s money. This does suggest that he sold the business as there were no “Sons” left to pass it on to. Henry’s remaining daughter and William Henry’s sister, the widowed Margaret Ann Hough remains at 49 Sackville Street until her death in 1942, but she too leaves very little in her will. So where did the family fortune go? Both Carter sons are remembered on the Barnsley Grammar School Old Boys’ War Memorial now on display in the Cooper Art Gallery. Harry Carter, presumably because he had been a chorister there, was also remembered on the Barnsley, St George's Church, Memorial Plaque which was lost when the church was demolished.